Cook spinach according to directions on package. Drain and reserve liquid. In a medium saucepan, melt butter over low heat. Add flour, stirring until blended and smooth, but not brown. Add onions and sauté 3-5 minutes or until wilted. Add evaporated milk, spinach liquor and Worcestershire sauce slowly, stirring constantly to avoid lumps. Cook mixture until smooth and thick, stirring constantly. Add seasonings and cubed cheese. 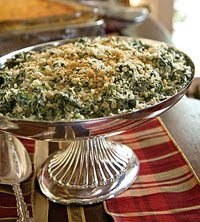 Stir until melted and combine with cooked spinach. This may be served immediately or put into a casserole and topped with buttered bread crumbs. The flavor is improved if the latter is done and kept in refrigerator overnight. Bake at 350.